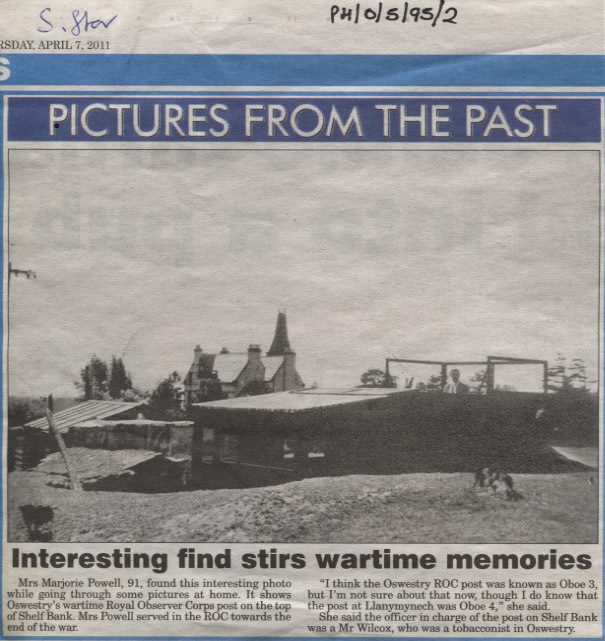 Newspaper articles (Shropshire Star April 7th & 11th 2011) & & photograph. Information collected by Derek Williams in 2011. Photograph of Royal Observer Corps Post (Oboe 3) on Shelf Bank, Oswestry during WW2. Individual in photo may be Mr. Wilcox, a local tobacconist who was the officer in charge. Other staff members were: Radford, the butcher, W. Price, carpenter/undertaker, Pearce, a blacksmith whose business was near the traffic lights on Chutch Street & Upper Brook Street and “Os” Martin, coal merchant. 3 lady members were: Esther Jones, Mrs. Powell (34 Walford Road) and another.